Uber Technologies Inc. is investing in Lime as part of a US$335 million financing round, the companies plan to announce on Monday. The deal, led by Alphabet Inc.’s venture arm GV, values the scooter business at US$1.1 billion. While details of the partnership are still being finalized, Uber plans to promote Lime in its mobile application and slap its logo on the scooters, executives from the two companies said. Uber took a similar step with a startup called Jump Bikes, which rents electric bicycles, before acquiring the business for more than US$100 million in April. Uber said it still plans to roll out e-bikes in more cities around the world. The Uber-Lime alliance has implications for the brewing scooter ground war. Since Lime was founded 18 months ago, the San Mateo, California-based company has raised US$467 million. Los Angeles-based Bird Rides Inc. has nearly as much cash. It was founded by Travis VanderZanden, a onetime Uber executive who has adopted a similar aesthetic to his former employer: In contrast to Lime’s bright color scheme and affable executives, Bird uses darker tones, and its founder is a controversial figure. Investors recently valued VanderZanden’s year-old company at US$2 billion. 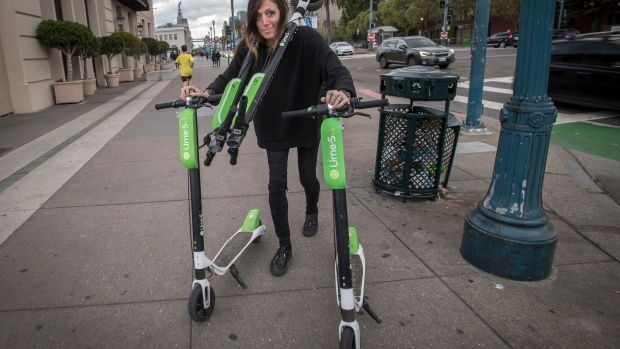 GV partner Joe Kraus is joining Lime’s board, and he’s very excited about scooters. He said: “This reminds me a tremendous amount of the early days of the Internet.